The Color Picker Tool is used to select a color on any image opened on your screen. By clicking a point on an image, you can change the active color to that which is located under the pointer. By default, the tool works on the active layer, but the Sample Merge option lets you grab the color as it is in the image, resulting of the combination of all layers. Only colors in visible layers are used. An Info window opens when you click on the image. by pressing the Ctrl key while using a paint tool. 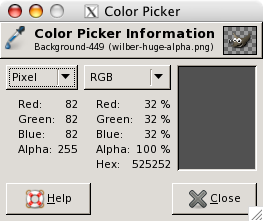 The Color-picker dialog is not opened during this operation and the tool remains unchanged after releasing the key. Nevertheless, you can get information by using the Pointer window. If the pick mode is set to Set foreground color, then pressing the Ctrl key switches the tool into the Set background color mode. If the pick mode is set to Set background color then the key switches the mode to Set foreground color. When the pick mode is Pick only, the key doesn't do anything. By pressing the Shift key, the Color Picker Information window is opened when you click on a pixel. The Pointer Information gives you the same information permanently. But be warned, it defaults to Sample merged. When enabled, the Sample Merged checkbox will take color information as a composite from all the visible layers. Further information regarding Sample Merge is available in the glossary entry, Sample Merge. The Radius slider adjusts the size of the square area that is used to determine an average color for the final selection. When you keep clicking the layer, the mouse pointer shows the size of the square or radius. The color of the selected pixel will be shown in an Information Dialog, but not otherwise used. The Foreground color, as shown in the Toolbox Color Area, will be set to the color of the pixel you click on. 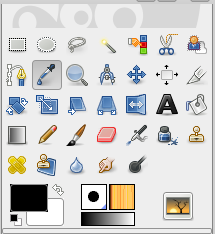 The Background color, as shown in the Toolbox Color Area, will be set to the color of the pixel you click on. When this option box is checked, the picked color is sent to the active color palette. See Palette Editor. When this option is checked, the information window is opened automatically. The Shift key allows you to toggle this possibility temporarily.